a. Science: SSC/Equivalent and HSC/Equivalent both 7.0.
a. Please prepare a recent color Photograph (Dimension 300x300 pixel JPG format within 150KB), Ready A 11 digit Mobile Number and Printer. c. Applicant SSC and HSC Roll, Board Name, Passing Year and Registration Number Input. d. Click next step and select your Quata (if any), Mobile number and other information input. e. Submit your Application Form. f. Payment Slip Download and Print. g. Payment ....... University of Dhaka authority Bank. 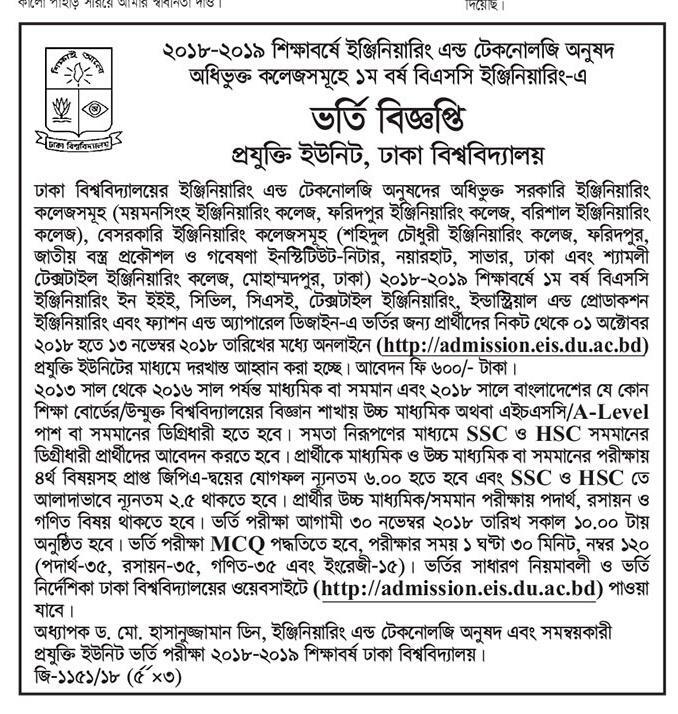 University of Dhaka Technology Unit Engineering Admission Authority will published admit card http://admission.eis.du.ac.bd/. Every candidate Login their appliaction account download Admit card Print this Admit card A4 size paper. University of Dhaka Technology Unit Engineering Admission College Test admission authority will published seat plan http://admission.eis.du.ac.bd/. University of Dhaka Technology Unit Engineering Admission College will published as soon as possible Admission Test Result. 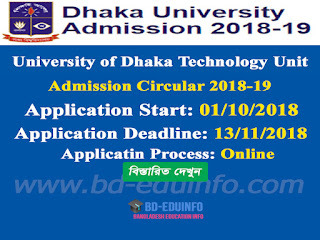 Any applicant can download and view from University of Dhaka Technology Unit Engineering Admission official website http://admission.eis.du.ac.bd/ search their Admission Test Roll Number. 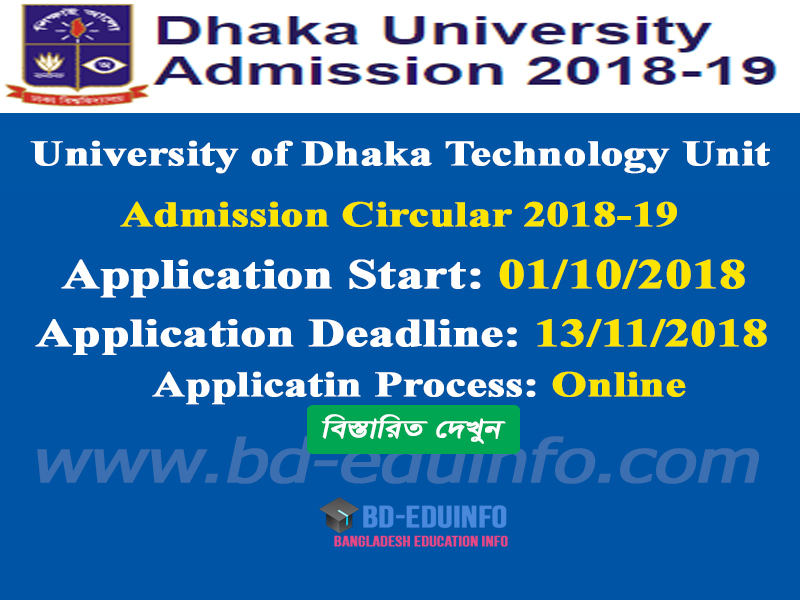 Tags: www.admission.eis.du.ac.bd, www admission eis du ac bd, www.du.ac.bd, www du ac bd, University of Dhaka Technology Unit Engineering Admission Circular 2018, University of Dhaka Technology Unit Engineering Admission Test Result 2018, University of Dhaka Technology Unit Engineering waiting list 2018, University of Dhaka Technology Unit Engineering Admission Circular, University of Dhaka Technology Unit Engineering Admission Notice, University of Dhaka Technology Unit Engineering Admission Admit Card Download, University of Dhaka Technology Unit Engineering Admission Mark Distribution, University of Dhaka Technology Unit Engineering Mark Distribution 2018, University of Dhaka Technology Unit Engineering Online Application 2018.
www.admission.eis.du.ac.bd, www admission eis du ac bd, www.du.ac.bd, www du ac bd, University of Dhaka Technology Unit Engineering Admission Circular 2018, University of Dhaka Technology Unit Engineering Admission Test Result 2018, University of Dhaka Technology Unit Engineering waiting list 2018, University of Dhaka Technology Unit Engineering Admission Circular, University of Dhaka Technology Unit Engineering Admission Notice, University of Dhaka Technology Unit Engineering Admission Admit Card Download, University of Dhaka Technology Unit Engineering Admission Mark Distribution, University of Dhaka Technology Unit Engineering Mark Distribution 2018, University of Dhaka Technology Unit Engineering Online Application 2018.